AVONDALE - The grandson of R.J. Reynolds slammed Big Tobacco for funding Issue 4 and called on Ohio voters Thursday to support a blanket ban on smoking in public places. "They're not supporting (Issue 4) for your health," Patrick Reynolds said. "They're doing it to protect future profits." Reynolds and the American Cancer Society urge Ohio voters to vote no on Issue 4 and vote yes on Issue 5. Voters will have to choose between the two smoking measures on the Nov. 7 ballot. Issue 4, a proposed constitutional amendment supported by tobacco makers and Ohio's bar and restaurant industry, would allow smoking only in designated areas in restaurants, and in bowling alleys and other places. Issue 5 - a proposed state law - would ban smoking in workplaces and public places such as restaurants and bars. He said concerns that smoking bans would cut down on business at bars and restaurants were off base, citing studies from California and Massachusetts that showed sales tax revenues to those businesses remained steady and, in some cases, increased. Reynolds called Issue 4 "a blatant attempt" to supersede Issue 5 because it is a constitutional amendment. If both measures pass, said Reynolds and Debra DeCourcy, president of the American Cancer Society's Hamilton County board, Issue 4 would take precedence. The measure would overturn 21 local ordinances banning smoking in public places, Reynolds said. Issue 4 would put restaurant and hospitality workers at continued risk for health problems from secondhand smoke, including lung cancer, emphysema and heart disease, he said. "It would make it unconstitutional to protect half a million Ohioans employed in the hospitality industry from secondhand smoke," he said. Issue 5 is supported by the American Cancer Society, the American Heart Association and the American Lung Association. Reynolds' father, R.J. Reynolds Jr., and brother, R.J. Reynolds III, died of lung ailments "from smoking the products that made our family rich and famous," Reynolds said. "When my grandfather founded the R.J. Reynolds Tobacco Co. in 1875, he didn't know tobacco was going to go on to kill millions of people around the world." Reynolds said he sold off his stock in 1979 and established the Foundation for a Smoke-Free America. "I want my family to be on the right side of the issue for once," he said. 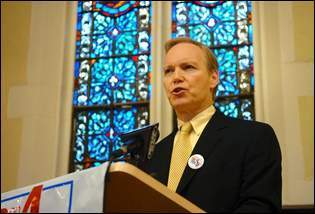 Patrick Reynolds talks during a press conference at the American Cancer Society. • Allow establishments, facilities and outdoor areas to be declared "smoke-free"